How do I know if it is the Lord speaking? This is the biggest question when it comes to learning to listen to the Lord in prayer. When we look in Scripture, everyone seems to know when it is God who is speaking, but, but the prophets and priests who heard from God had to learn how to recognize God’s voice. When the Lord called Samuel in the middle of the night he did not recognize who was calling to him. He thought it was Eli. Eli did not realize it was the Lord at first. But the Lord was patient and persistent and eventually Eli clued into what was happening and instructed Samuel to respond and say “Speak, Lord, for your servant is listening” (1 Samuel 3:10). Samuel began to learn to listen to the Lord and the Lord continued to reveal himself to Samuel through his Word (1 Samuel 3:21). Samuel learned to recognize the Lord’s voice by studying his Word. So as we spend more time in God’s Word we will grow in discerning whether what we we hear is from the Lord or not. God is not going to give us direction to do something which is contrary to his Word in scripture. So as we read, study and immerse ourselves in Scripture we will grow in being able to say “that sounds like the Lord.” We always need to examine what we hear to determine if its God or not. Is what we are hearing something which will exalt Jesus in the present and future? Is what we are hearing consistent with Scripture’s revelation of God’s will and character? Do other people affirm what we are hearing? Is their fruit? Is there confirmation, through other people or through what happens? Samuel and Eli talked about what had happened after the Lord had spoken to Samuel. It helped to confirm that it was the Lord speaking and it was further confirmed when what Samuel had heard actually happened. There was fruit. Praying together in corporate prayer should be an important part of our prayer lives. As God’s Word shows, when we pray in agreement our prayers become powerful. But how do we pray in agreement? Is it simply saying, “Yes, I agree!” when someone else prays? To some extent, it is as simple as that, as we join together in prayer simply saying I agree is the easiest way of agreeing. But joining together in a prayer of agreement can be far richer. Often when we pray someone begins with one issue and then the next person prays for something else and so the prayer time continues. We join together in agreement for one another but at the end of the prayer time everyone has really just been praying their own prayers. Now, if we imagine that each prayer offered is like a piece of a jigsaw puzzle, then at the end of the prayer time there would just be a bunch of random pieces on the table. A better way forward is to let our prayers build on each other’s prayers. One person starts and the next person picks up the theme and continues the prayer. To use the jigsaw illustration, the first person puts their puzzle piece down and then the next person puts a connecting piece down. To do that well it requires everyone paying attention to what is being prayed and everyone needs to be listening to the Holy Spirit, who guides and directs where the next prayer piece needs to go. So at the end of the prayer time there is a picture, which has formed. For example, if one person begins to pray for the leaders in the church the next person could pray specifically for the elders and then some one else could pray for a particular issue the elders may be dealing with and someone else may then pray for a family who is affected by the issue the elders are working on and so the prayer continues to build. If one theme comes to an end then someone can pick up another theme and pray. For example, they could pray for the work of the deacons. Praying in agreement by building on each other’s prayers is a powerful way of effectively covering issues with prayer. 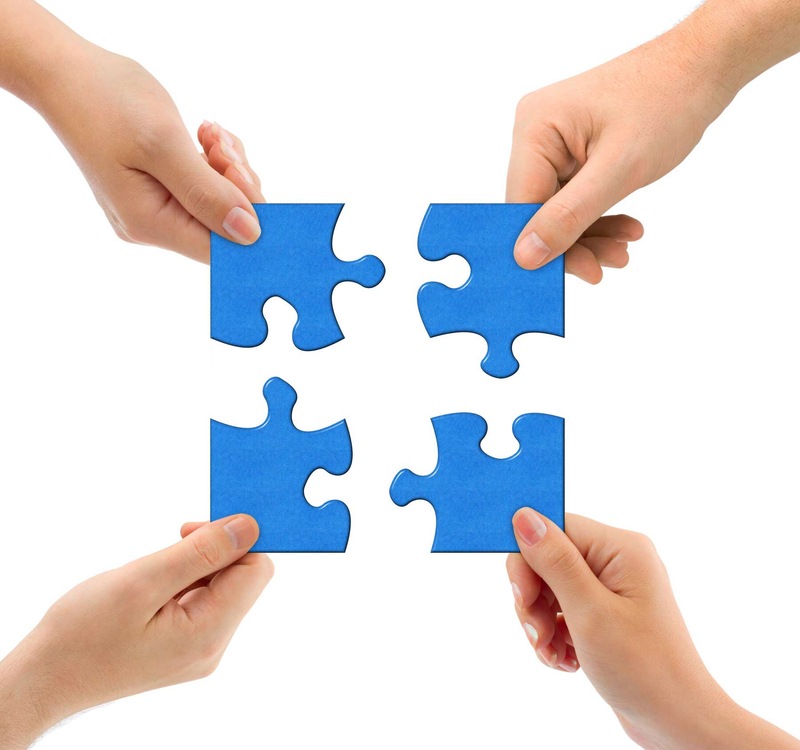 It allows the different gifts of individuals to be used together, it enhances fellowship as the Holy Spirit directs, and brings the jigsaw puzzle picture together. When we look at the life and ministry of Jesus we see that he was continually doing what the Father instructed him to do. We could say that Jesus was continually on the father’s agenda. Because of that Jesus did not always react the way we might expect him to react. He waited two days before leaving to visit Lazarus, because he was on his father’s agenda and not his own. Jesus wanted to do the work His father had for him to do, even when that ultimately meant that he had to go through the agony of rejection, crucifixion and death. Jesus listened to the direction of his father and was obedient, obedient to death – even death on a cross (Philippians 2:8). How did Jesus stay on the Father’s agenda? As we look at the gospels we see that when Jesus chose the 12 disciples he did so after spending time in prayer. When Peter confessed that Jesus was the Christ and Jesus explained the necessity of his suffering, death and resurrection. The interaction is done out of a context of prayer (Luke 9:18) Jesus was able to stay upon the Father’s agenda because he spent daily time in prayer with the Father. As he did this he was in continual relationship and was available to receive the directions he required. “So what do you have for me today, Lord?” has become a frequent line in my prayer journal, its written and prayed in a sense of anticipation and excitement. Quite often there is a glimpse or a hint at what it to come, sometimes just the affirmation “wait and see!” It changes the perspective of the day because there is now an anticipation of what God is going to do. It maybe small but it can at times be big. On my recent trip to Israel, I had prayed in the morning for God’s direction for the day and the response “I have something for you, wait and see” came back it was a dull and rainy day and as we arrived at a point in Jerusalem overlooking the temple mount abd the Western wall there was this amazing double rainbow arching over the temple mount and mount of Olives. The most vivid of rainbows I have ever seen. God did indeed have something for us and in a big way. He was giving us a sense of affirmation for the ministry we were doing but also just demonstrating his amazing grace to us. An expression of his love.. The Lord wants us to enjoy abundant prayer times with him everyday, where by he is showing us what he is doing and inviting us to join Him in His agenda. Throughout the Scriptures we find passages, which confirm that prayer makes a difference. When Joshua and the Israelites were fighting the Amalekites (Exodus 17) it was the prayers of Moses, on top of the hill, which made the difference in the battle. When Elijah was on the top of mount Carmel it was prayer that caused the end of the drought. Seven times Elijah bent down to the ground in prayer before the rain came (1 Kings 18:41-45). “The prayer of a righteous man is powerful and effective,” writes James (James 5:16). Pray was a strategic tool for building the early church. In Acts 1:14, we see that the disciples “all joined together constantly in prayer.” Prayer was effective in initiating the release of Peter from prison through the intervention of an angel (Acts 12:1-19). Paul instructed the believers in Colossi to “devote themselves to prayer” (Colossians 4:2). He also included prayer as a vital piece of the armour of God instructing the Ephesians to “pray in the Spirit on all occasions with all kinds of prayers and requests” (Ephesians 6:18). James Houston describes prayer as “rather like joining an underground resistance movement in an enemy-occupied country. We fight back in prayer to overthrow the kingdom of darkness with the light of the gospel.” We sometimes forget the true power that prayer has. Prayer can quickly get absorbed into the everyday part of our lives, the quick prayer before a meal or before climbing into bed at night and that is important for us to do. But it can also lend itself to us taking prayer for granted and to miss the potential power that is present in prayer. When Paul tells the church in Corinth, “The weapons we fight with are not the weapons of the world. On the contrary, they have divine power to demolish strongholds” (2 Corinthians 10:4), one of the weapons he was talking about is prayer! If you have ever watched a building being demolished by a controlled explosion, you know that the explosive charged are strategically placed and only after sufficient warning is given does the person hit the button or press down the plunger causing the explosion and the demolition of the building. We do not hear sirens blasting and a warning announcement saying “clear the area and watch out, we are about to pray!” But perhaps we should! It can be helpful to think of prayer like a stick of dynamite. It’s not something that should be treated lightly because of the powerful explosion it can produce. We get the word dynamite from the Greek word dunamis, which means “the power to do something.” Prayer is the power to do something. Prayer has the power to change hearts, transform lives, demolish strongholds and push back the kingdom of darkness. After the believers prayed together in Acts 4 we read that “the place where they were meeting was shaken. And they were all filled with the Holy Spirit and spoke the word of God boldly” (Acts 4:31). Acts 1:14 shows the believers were constantly in prayer. It was out of that time of continual prayer that the Holy Spirit came at Pentecost. It was the work of prayer which caused the collapse of the Berlin wall. It was the prayer of the nation during World War II which led to the miracles of Dunkirk and the Battle of Britain. It is important to remember that our prayers are powerful weapons. It is why after Paul had instructed the believers in Ephesus to put on the full armour he instructs them to pray in the Spirit on all occasions with all kinds of prayers and requests (Ephesians 6:18). The work of the kingdom must be bathed in prayer. Scripture gives us numerous examples of this: Moses who stood in intercession on the hillside during the battle at Rephidim (Exodus 17) or Daniel, who stood in the gap for the nation of Israel while they were in exile (Daniel 9). The prophet Ezekiel reminds us that God is looking “for a man among them who would build up the wall and stand before me in the gap on behalf of the land (Ezekiel 22:30). But what do these watchmen on the wall do? How are those who stand on the wall and in the gap pray? In two words the role of the intercessor is to pray “in” and to pray “out.” They pray “in” what God is doing, the advancement of the kingdom of God. Then they pray “out” the plans and the schemes of the enemy. The watchman stands in the gap between the kingdom of darkness and the kingdom of light. An intercessor listens to the Holy Spirit to discern what it is God want to do in a particular situation and then they begin to pray as they have been directed into the things, which the Lord wants to do. The job of the intercessor is to join in the work of praying into existence the things of the Lord, “Thy kingdom come, on earth as it is in heaven.” So the intercessor is praying for hearts to be changed or for people to be drawn deeper into a relationship with the Lord. They are praying for God’s kingdom to be advanced. At the same time an intercessor is also discerning through the Holy Spirit what the strongholds and schemes the enemy is using to prevent the advancement of the gospel. Then they are praying for the removal of those strongholds and barriers. Prayer is the weapon, which can demolish strongholds “The weapons we fight with are not the weapons of the world. On the contrary they have divine power to demolish strongholds (2 Corinthians 10:4). Through prayer the hindrances to the advancement of the gospel can be removed.